This weekend a mile long stretch of Woodward was transformed into a glowing avenue of art for the inaugural run of Dlectricity. Using light, shadow and motion more than 35 artists turned Midtown Detroit's cityscape into a menagerie of larger than life spectacles depicting some truly surreal scenes. Well-known regional art acronyms such as the DIA, DSO, and CCS are among those participating in Detroit's first ever white night festival and the artists are a collection of local, national and even international luminaries. Despite the constant rain and temperatures in the 40s people came out in droves, crowding the sidewalks and narrowly dodging both puddles and each other's umbrellas. 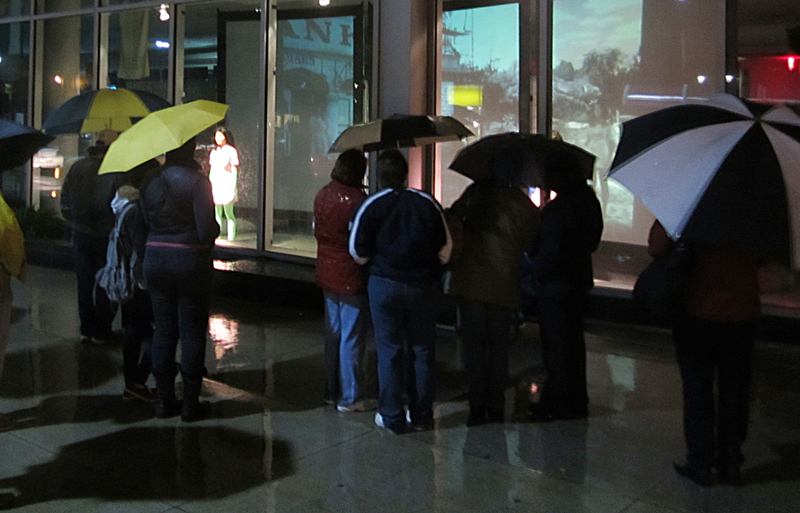 The weather did nothing to dampen peoples' enthusiasm for the event. Laughter and lively discussion found around nearly every exhibit and at one point the crowd in front of the DIA broke into spontaneous applause for the intrepid, and extremely wet, cyclists of the 'Share Detroit' project as they rode down the street. In fact most people seemed to view the weather as a sort of price of admission, the wet and the cold was little more than a nuisance that could be readily ignored whenever an exhibit caught someone's eye. I bet the local coffee shops made out like bandits though. 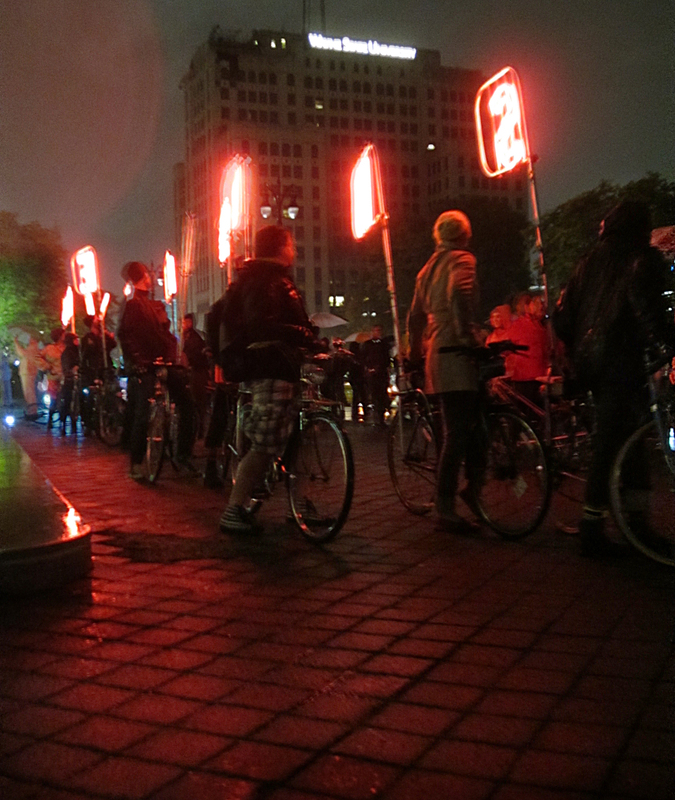 Unfortunately not everything about Dlectricity was immune to the rain. The 'StereoNegative' project ran into difficulties and was only partially assembled by the time the event started. At CCS the rain and the cold weighed down the Mylar balloons of 'Contour1' so much that their campus looked like a graveyard for 'Get Well Soon' baskets. On the other end of Midtown the Sugar Hill Block Party's outdoor component was also a bust. Apparently for most people 'enjoying a beer garden' and 'wondering how long you have before hypothermia sets in' are mutually exclusive activities. On the bright side, all of these issues were either directly or indirectly rain-related and with the weather cleared up everything was reportedly back on track for Saturday night. Despite these technical hiccups, Dlectricity's first night was filled with sensational works of art. Dana Bells 'Psychic Effects: A Delicate Balance' is a performance piece housed in the WSU welcoming center. The dancers' repetitive, almost robotic movements are set to a surreal soundtrack designed to underscore the desperation hiding beneath their remoteness. There was always a sizable crowd there whenever I passed by. 'Knowledge is Power' by NewD Media is a dynamic 3D animation projected onto the façade of the Detroit Public Library's main branch. The cinematic experience depicts humankind's quest for knowledge as well as the benefits, and costs, of acquiring it. The whole thing culminates with visions of the atomic bomb and the Apollo moon landing set to audio clips of JFK's historic speech at Rice University. After that there's some Dubstep and a trippy light show. 'I see You' by Apetechnology is a translucent snowman/otter/Ikea-light-cover thing that moves around, lights up, and kind of acts like a confused puppy. Not surprisingly it spent the first half of the night being mobbed by little kids. Those are just a few examples of the more than 30 innovative works on display. Over the years I've become a real fan of Midtown and it was great to see it so alive. There was great art, a festive atmosphere, and the locally owned shops had stayed open late and were filled with people curious to see what they had to offer. During the festivities I was lucky enough to talk briefly with Sue Mosey, head of Midtown Detroit, Inc and one of the major players behind the whole thing. 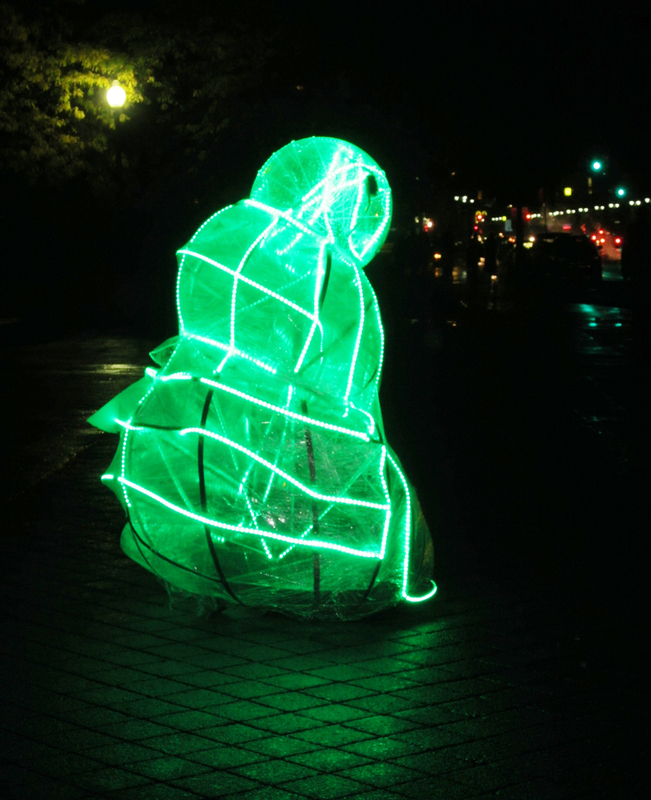 She was quite excited with how everything turned out in spite of the weather, "[Dlectricity]'s not just a great event, it's a shining example of Midtown's future." "I See You" by Apetechnology, in front of the DIA. "Psychic Effects: A Delicate Balance" By Dana Bells, performed by Meg Clixby, Talice Lee and Helen Schreiner at the WSU Welcome Center. "Whale" by Jacco Olivier at the Michigan Science Center. "The Ice Cave" by Graem Whyte with performances by Tzarinas of the Plane and other acts. "Laser Starship" by Yvette Mattern at the Charles H. Wright Museum of African American History. "Share Detroit (Rheostat Ride)" by Thick Air Studios.